The application process will open again by September 2019. 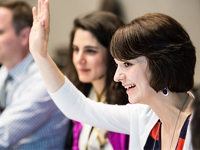 The NAFSA Trainer Corps is made up of approximately 300 member volunteers who develop, deliver, and maintain the NAFSA Core Education Program (CEP) curriculum and materials. Trainer Corps members deliver the NAFSA CEP Workshops at various events, programs, meetings, and conferences throughout the year, including NAFSA's Annual Conference, Regional Conferences, and On-Site offerings all over the country. Trainer Corps members are recognized as valuable leaders within their regions and Knowledge Communities. They are ambassadors for the NAFSA Core Education Program Workshops and e-Learning Courses, which build fundamental International Education Professional Competencies for international educators throughout their career. Trainer Corps provides service and opportunity for giving back to the development and advancement of international educators all over the world! Parinaz Zartoshty is the director of international student and scholar services at San Jose State University. Besides managing the staff and office and providing regulatory guidance, she is also actively involved in intercultural training for staff and faculty on campus. Parinaz received her bachelor’s degree from Cornell University in government/international relations and her master’s degree in international relations from Boston University. She is originally from Iran and is fluent in several languages including Farsi, French and German. 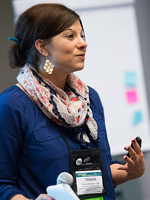 She has been an active NAFSA Trainer Corps member since 2011, presenting at multiple workshops, both regionally and nationally. Parinaz has a passion for international affairs. Her previous work experience includes work with UNICEF and Amnesty International. Susan Lochner Atkinson is the associate director for advising at International Academic Programs at the University of Wisconsin-Madison. She has also worked in education abroad at the University of Wisconsin-Eau Claire and the University of Minnesota. Atkinson has been active in NAFSA for over 15 years, has presented workshops and sessions at the regional and national level, and has been a Trainer Corps member since 2009. She holds a BA in Spanish from the University of Wisconsin-Eau Claire and an MA in comparative international development education from the University of Minnesota. Atkinson studied abroad in Mexico and Spain. Her professional interests include advising, curriculum integration, diversity and inclusion, process management, and training. Sara Troy is Director of Program Development at CEA Study Abroad. Sara’s role at CEA is to lead and manage the program development team, which focuses on creating programs that meet the needs of all students. She works closely with both CEA's international staff, and faculty & staff from U.S. universities to develop and deliver strong, acdemically sound programs. Sara has extensive experience in other student-related areas such as academic advising, international student advising, university housing, and program management at both large public and small private liberal arts colleges. Sara studied abroad in Rennes, France through ISEP her junior year of college. C.K. Kwai is the Chief International Officer at Jacksonville University. He has worked in the areas of EA, IEM, and ISSS for the last 20 plus years. He has extensive experience in all aspects of International Education from developing new study abroad agreements to foreign credential evaluation and developing international student programming. Kwai’s expertise in higher education is in the field of international education and he has a PhD in educational policy and administration. He has presented at numerous NAFSA national and regional conferences, NAFSA’s Summer Institute, higher education institutions around the world, the NASPA national conference and is an adjunct professor at the Vietnamese German University in Ho Chi Minh City, Vietnam. Natalie Schlegel is Director of International Education at Bentley University in Waltham, Massachusetts. Her office manages exchange partnerships and a diverse portfolio of education abroad programs that serve approximately 700 undergraduate and graduate students annually. She came to Bentley in 2003 as Education Abroad Advisor. Previously, Natalie held positions at LASPAU: Academic and Professional Programs for the Americas, where she supported Fulbright grantees from Latin America, and at EF Foundation for Foreign Study, where she managed the placement process for high school exchange students. Natalie earned a BA in Economics and Spanish from Vanderbilt University, and an MBA from Bentley University. She is a member of the NAFSA Trainer Corps. Elizabeth Strong is the director of study away at Missouri State University, where she provides the strategic direction of study abroad programming. Since 2009, Strong has worked with her team to increase student participation from 263 students to over 700 students. In additional to collaborating with college leadership to develop opportunities that meet student learning and curriculum internationalization goals, Strong leads Missouri State's health and safety team for international travel, coordinating emergency response protocols to respond to international risk management issues. Dr. Holly Carter is the Director of Harlaxton College Programs and Director of International Programs for the University of Evansville and Harlaxton College. Holly has many years of experience developing and expanding international programs: as a US-based director, on-site program director, faculty member, and student abroad. Holly has her Ph.D. in Sociology/Health Services Research with a focus on International Health Care Delivery Systems. Holly also works as a Team Leader for Habitat for Humanity. She leads teams to build homes all over the world. She just completed her 25th international build. Erica Johnson currently works with the Global Enrollment Team as the International Admissions Director to place boarding students at Nord Anglia Education's college preparatory schools in the USA. She has over 15 years of experience in international education and previously held positions with Meritas and Study Group. Her cumulative areas of professional expertise include global multi-site team management, business system design and implementation, policy and procedures development, and corporate planning and budgetary direction. Erica holds a Bachelor of Arts in French from Albion College and is currently a degree candidate for an Executive Masters in International Education from King’s College London. Katerina Roskina is the Owner and Senior Evaluator at China Credential Services. Her professional interests are credential evaluation and research, integration programming, transnational education and academic exchange facilitation, international admissions consulting, training, and more with a mission to enable China-educated individuals to make educated choices about their study in the US, and US academic institutions to be able to assist those individuals to make the best of their investment in US education, and be able to develop viable transnational partnerships.Katerina holds a Master of Arts degree equivalent in Linguistics and Intercultural Communication with an emphasis on Mandarin Chinese. Her graduate research centered on ESL teaching and acquisition by native speakers of Mandarin Chinese. Her professional background is in ESL instruction and curriculum design in China, English-Chinese interpreting and translation, and comparative international education in the US. Betsy Morley has worked in international education for over 12 years at Ohio University, the University of Illinois Urbana-Champaign, and now at Albion College where she leads international admissions efforts. In her seven years in the international section of OHIO’s Undergraduate Admissions, Betsy evaluated foreign credentials, supported recruitment activities, and coordinated among campus offices on policy implementation and student support. In addition she supervised the transition toward a paperless application system and assisted with the university-wide conversion to PeopleSoft. She has lived in Senegal and France and has extensive personal and professional travel experience. With degrees from Agnes Scott College and New York University, she is an active Trainer Corps member, and presented at state and regional NAFSA conferences on study abroad, international admissions, and student support topics. Brad Huggins is the Assistant Director of International Student Success at Bellevue College, overseeing academic, F-1 visa and student life advising for over 1100 students. Brad has held many roles in both International Education and Student Affairs, including extensive international advising and as PDSO. Brad has a bachelor’s degree in Chinese Language and Culture with TESOL certification and a Masters of Education in Student Affairs Administration. Brad has been training for NAFSA for over ten years. Gwyneth A. Smith, Associate Director of the International Students and Scholars Office at Columbia University Medical Center, has been working in the field of International Education for 15 years. Gwyneth is responsible for immigration-related matters for the F-1 student population and H-1B faculty/staff on Columbia's Medical Center campus. Gwyneth is also proficient in J-1 Exchange Visitor matters. She holds both an M.A. in International Relations from the Brussels School of International Studies, through the University of Kent at Canterbury, England and an Ed.M. in International Educational Development, focusing on policy from Teachers College, Columbia University. Throughout this time she has presented at numerous local, regional, and national NAFSA conferences and at various One To World meetings. She has also presented for the American Immigration Lawyers Association (AILA). Gwyneth trains on F-1, J-1, and H-1B regulations. Gwyneth previously served as both Student and Scholar Regulatory Ombudsman and is currently Past-Chair and Scholar Regulatory Ombudsman for NAFSA Region X (New York/New Jersey). Denise Kinsella is currently the Associate Dean for International Education at Santa Monica College. Santa Monica College is a public community college with an F-1 population of about 3,200 students from more than 100 countries. She has worked in international education since 1986. Kinsella is part of the NAFSA Trainer Corps and has presented at NAFSA Region XII and NAFSA National conferences. In her current position, she supervises the admissions, student support and advising staffs, including developing and delivering innovative orientation programs. She meets directly with the most complex and challenging student cases. She has her MA in Intercultural Administration with an emphasis in Foreign Student Advising from the School for International Training (SIT) in Vermont. Elena was born and raised in Russia where she received a B.A./M.A. in Foreign Language and Literature (English) and taught English as a Second Language. She first came to the U.S. in 1993 as a J-1 exchange student and then in 1995 as an F-1 international student. She holds an M.S. in Information Science from Indiana University. She started her career in the field of international education at the end of 2003 at Louisiana State University, Baton Rouge, LA, as an International Student Advisor and then Assistant Director of the International Services Office. In 2009 Elena started working as an International Student and Scholar Advisor at the University of Michigan International Center, Ann Arbor, MI. She was advising the population of approximately 7,000 international students and scholars on all aspects of F and J visas, later adding H-1B processing to her duties. From August 2015 to September 2017 Elena worked at Northeastern University in Boston, MA as an Associate Director. She was managing the area of the office responsible for providing advising and processing of all employment-related requests for international students, as well as services for all J-1 scholars, for the population of about 13,000 international students and scholars. In October 2017 she joined Carnegie Mellon University Office of International Education as Associate Director of Foreign Student & Scholar Services. Ximena Corley is a Senior Scholar Advisor at Columbia University, ISSO Faculty and Scholar. She works in a large office that serves over 2,000 J-1 scholars a year. She also has experience working as an international student advisor. She has been working in the field of international education for 10 years. She previously worked at IIE and Rutgers University- New Brunswick. She has a MA in International Affairs from The New School. Jin Zhang is the associate director in International Student and Scholar Services at the University of Houston. Jin has being advising students and exchange visitors since 2002 as an advisor, SEVIS Compliance Coordinator and her current capacity. Jin has been an active NAFSA Trainer Corps member since 2006 and served as a trainer at numerous NAFSA state, regional and annual conference workshops on F and J advising. She has presented sessions on F and J related topics during these conferences. She served on the CEP J-1 Intermediate Curriculum Team in 2012. Jin received her Bachelor’s degree in Optics from Shangdong University in China, and her Master and Doctorate degrees from Houston Graduate School of Theology. Being international student herself, Jin enjoys helping international students and visiting scholars. Michael Freeman is the director of International Students and Scholars at the University of Arkansas. In this capacity, he advises scholars on employment related permanent residency, H and J issues, supervises a fantastic team of creative and dedicated professionals and develops models to help increase international education opportunities for the University of Arkansas and NW Arkansas communities, He has served as Dean for the J-1 Advising - Intermediate CEP workshop, NAFSA Academy Coach and as Chair for NAFSA Region III. Michelle serves as the International Compensation and Taxation Manager for North Carolina State University. In her roll, she assists NC State to successfully compensate and tax the university’s foreign national students, scholars, and employees. Michelle is responsible for ensuring compliance with payment and taxation regulations and procedures, as well as providing guidance for the University’s employees working outside of the United States. Michelle also assists and advises NCSU’s international students and scholars with their tax filing and payment requirements. Kelly McCullen transitioned from a small private high school in urban Los Angeles to California State Polytechnic University, Pomona (Cal Poly Pomona) in 2002. She was an Academic Advisor in the College of Business until 2007 when she moved to the International Center as an International Student Advisor. Kelly began coordinating Student and Scholars Services in the International Center in 2010 where she oversees daily operations serving F and J students and scholars, and serves as the PDSO and RO. Since 2010, she implemented the SEVIS/PeopleSoft Batch process and recently moved the office to a paperless business process. Kelly earned her undergraduate degree in Business Administration and Master’s degree in Public Administration from Cal Poly Pomona. She has presented many F and J Visa CEP workshops as an active member of NAFSA Trainer Corp. Kelly credits NAFSA with providing many opportunities for professional development in the field and enjoys serving as the International Student Representative on the NAFSA Region XII team. Kelly and her husband Fred live in La Verne, California where they enjoy their two German Shepherds Zoey and “baby” Titus. Kim Steinmetz serves as the Program Director of International and Immigrant Student Services at Johnson County Community College (JCCC). She oversees all aspects of support for international and immigrant student services related to admission, visa and status concerns, and community support. Jennifer von Drehle is the Associate Director for Student Engagement and Leadership at DePaul University. 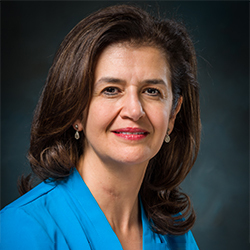 She has been active in the field of International Education since 2001 and has held leadership roles in international student services, education abroad, English language instruction, and international admission. She is passionate about intercultural communication and experiential learning. Emma serves as the Associate Director of the Office of International Education at the University of Vermont. In this role, she leads the international student services team for a rapidly-expanding international population of graduate, exchange, and pathway students. She additionally supports UVM's international scholars and provides leadership for the office which supports these functions as well as study aboard. Emma is the PDSO for UVM and sets institutional policy, manages the departmental database, and provides leadership for programming and advising. She manages the departmental database and has led much of the efforts to switch to fully paperless processing to improve efficiencies so that advising staff can focus energy in connecting with clients. Within NAFSA, Emma has presented and trained widely at the state, regional, and national level and is a member of the Trainer Corps. She served as the Vermont State Representative for NAFSA from 2012-2015. She authored the current version of NAFSA's "Friendship with your American Host" brochure. In 2017, she was selected as the Sally M. Heym recipient from NAFSA Region XI for her mentorship and leadership in the field. She holds her undergraduate and Master's degree from the University of Illinois at Urbana-Champaign, where she also worked for three years in the office of International Student and Scholar Services as the primary advisor to international undergraduate students. Prior to moving to Vermont, she spent a year living in south-central Vietnam while working at Dai Hoc Quy Nhon as a Fulbright grantee. In addition to her current professional roles, Emma is a PhD student in Educational Policy Studies with research interests in institutions that dis/interrupt higher education ecosystems abroad. Erin Garcia is the Director of International Programs & Services and PDSO at Lynn University where she oversees the International Student Services Office and Center for Learning Abroad. She also serves as RO for South Central Rotary Youth Exchange; she is an alumna of the RYE program and a Rotarian. Erin received her B.A. in International Studies/German at Southwestern University and a M.A. in College Student Development from St. Edward's University. She has been involved in NAFSA for several years, having participated in Advocacy Day and Trainer Corps. Chelsea Kindred is Director of Alumni Development and Research at Academic Programs International (API), an international education organization based in Austin, Texas. Chelsea manages API’s Alumni Development Programs and Research projects, where her responsibilities include drafting curriculum, facilitating training, managing and providing professional contextualization of the international experience for participants. Chelsea has presented at national and regional levels on many topics, including alumni development, diversity and inclusion, social media/technology, and orientation strategies. Chelsea earned a BA from the University of Texas at Austin and an MFA from Chatham University. Chelsea wrote the “Re-Entry: Advising Strategies and Programming” chapter in NAFSA’s Guide to Education Abroad: 4th Edition and was lead trainer for the 2016 and 2017 NAFSA annual conferences Current Topic Workshop: Current Trends in Education Abroad Alumni Programming. She recently co-authored a journal for the education abroad returnee experience, a new NAFSA publication released in 2018. Alisa Lopez has served in higher education for over 15 years and currently leads business development and consulting for NEIS-Education. Prior to this role, she served as Executive Director of Full-Time Recruitment at Pepperdine University's Graziadio Business School where she directed worldwide market development, student recruitment, and enrollment management for the full-time MBA and specialized master’s programs. She also served as Executive Director of Global Programs at Pepperdine's Graziadio School where she designed and managed international courses, student and faculty exchanges, and 40 international partnerships. Prior to her work in international education, Alisa began her career in international business and trade finance at Honda Trading America Corporation and the Export-Import Bank of Japan. Her professional international career has been enhanced by previous experience in Nigeria, Japan, South Korea, France, Chile, El Salvador, and Canada. Alisa holds a Masters in International Management degree from Thunderbird School of Global Management in Arizona, a Bachelor of Arts in French and a Bachelor of Science in Business from West Virginia University. She is an experienced program and project manager with PMO-CP certification, Agile certificate, and prior PMP certification. Connect with other members of the Trainer Corps Community in the Community Workspace. Get answers to all of your Trainer Corps questions.